When man (or more specifically, a man) stepped foot on the surface of the moon in July of 1969, software was a relatively new development. In fact, the moon mission was one of the first times this kind of engineering was used in such a fundamental—not to mention high stakes—way. History was being written that day, and a woman named Margaret Hamilton had authored the code that made it happen. Hamilton was born in 1936, and received a BA in math from Earlham College. 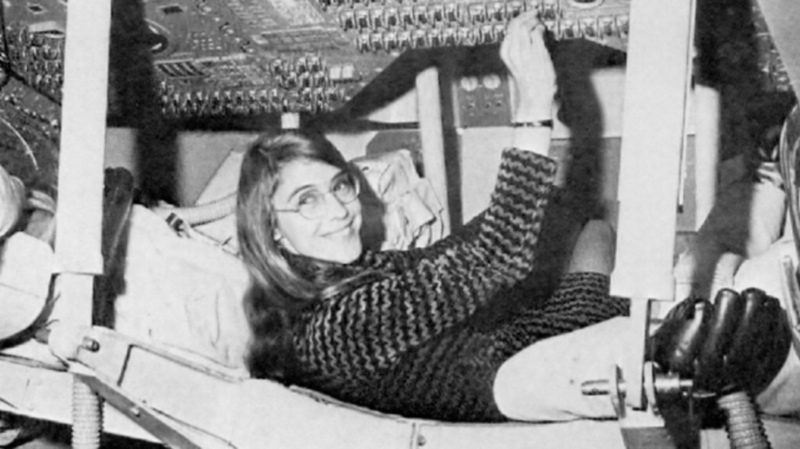 She taught herself to program before becoming the director of the Software Engineering Division of the MIT Instrumentation Laboratory, which developed software for the NASA Apollo programs. In the photo below, Hamilton stands with printouts of the code for the Apollo Guidance Computer—the same code that helped us reach the moon—which was developed by the team she led, and much of which she wrote herself. This shot was taken during the Apollo 11 mission, when Hamilton was 33 years old. Her code ran in one of the first ever chip-based computers, which had only 64 kilobytes of memory. Hamilton, among the first women to join the world of software development, was a modern day pioneer. She’s even credited with coining the term “software engineering.” For her contributions to the field, Hamilton received the Augusta Ada Lovelace Award from the Association of Women in Computing in 1986, and the NASA Exceptional Space Act Award in 2003. Today, she’s the CEO of Hamilton Technologies, Inc., a company she founded in 1986. Last year, Hamilton was interviewed by El País about the attention she’s received from the circulation of her photo online. Software during the early days of this project was treated like a stepchild and not taken as seriously as other engineering disciplines, such as hardware engineering; and it was regarded as an art and as magic, not a science. I had always believed that both art and science were involved in its creation, but at that time most thought otherwise. Knowing this, I fought to bring the software legitimacy so that it (and those building it) would be given its due respect and thus I began to use the term “software engineering” to distinguish it from hardware and other kinds of engineering; yet, treat each type of engineering as part of the overall systems engineering process. When I first started using this phrase, it was considered to be quite amusing. It was an ongoing joke for a long time. They liked to kid me about my radical ideas. Software eventually and necessarily gained the same respect as any other discipline. Hamilton also wrote that the Apollo 11 mission had the "most exciting, memorable moments on the Apollo project," but that Apollo 8 was a close second.